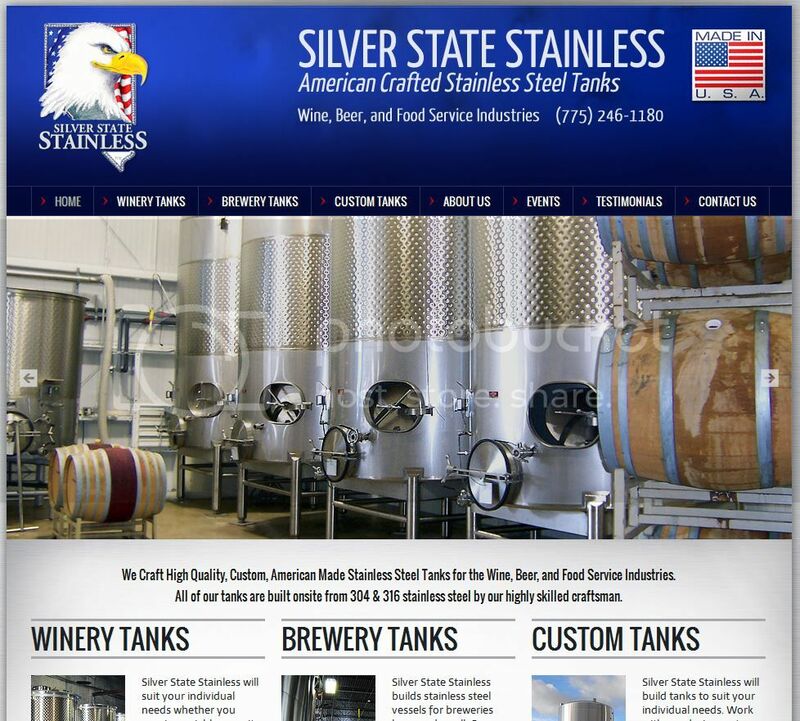 Silver State Stainless is a High Quality stainless steel tank manufacturer. We produce American made custom stainless steel containment systems and products. As a company, we provide stainless steel fabrication services combined with high customer value and on-time delivery. We are employee oriented and believe in American ingenuity and high quality craftsmanship. We serve the needs and requirements of the wine, craft brewing, beverage, and food service industries. We provide high quality, American crafted stainless steel tanks. Silver State Stainless will suit your individual needs whether you require variable capacity, red wine, white wine, or any specialized tanks. Our tanks are crafted onsite by our talented team of designers and fabricators. We build vessels to custom volumes and dimensions as your unique processes and applications require. Come see us at Unified Wine & Grape Symposium! We will be offering discount opportunities on stainless steel custom fabricated wine tanks. New styles, innovations, and techniques to be explained and demonstrated at the booth. Silver State Stainless continues to be a leader in the beer, wine, distilling, and food processing industries and we pride ourselves on the utilization of domestic materials and stateside manufacturing with all aspects of the tank fabrication being completed in Nevada. Come by booth 1729 and ask us about the new and exciting work we are doing to enhance and extend your capabilities in the cellar. Offering discount opportunities on stainless steel custom fabricated wine tanks at the WIN Expo on December 6. New styles, innovations, and techniques to be explained and demonstrated at the booth. Come by booth 124 and ask us about the new and exciting work we are doing to enhance and extend your capabilities in the cellar. Use our promo code (SIL124) to get free access to the trade show floor! Whether you require variable capacity, Red Wine, White Wine, or any specialized tanks Silver State Stainless can do it. Our tanks are crafted onsite by our talented team of designers and fabricators. We build vessels to custom volumes and dimensions as your unique processes and applications require. Need a custom built tank? Silver State Stainless will build tanks to suit your individual needs. Work with our designers to customize tanks for your unique processes and applications. We build tanks to exact specifications for the food service, beverage, and many other industries. Silver State Stainless will suit your individual needs whether you require variable capacity, red wine, white wine, or any specialized tanks. We build vessels to custom volumes and dimensions as your unique processes and applications require. Silver State Stainless builds stainless steel vessels for breweries large and small. Our tanks are crafted onsite by our talented team of designers and fabricators. Complete brewhouses, fermenters, brite tanks, lagering tanks, yeast brinks, hop backs, and other customized tanks are all available. Visit Silver State Stainless at Booth # 1729 to find solutions and options for your stainless steel tank needs. Our emphasis on customer service coupled with the highest standards of quality will provide the best products and service. Silver State Stainless is pleased to announce the launch of the brand new website: http://www.silverstatestainless.com/. The new website offers a contemporary look and streamlined user experience. It features enhanced resources and functionality designed exclusively for the winery, brewery, and custom tank end-users. Innovative functions include a photo gallery showcasing recent projects, as well we upgraded sections for specific tanks - designed to offer valuable information in just a few simple clicks. Silver State Stainless is expanding operations!